St. Johns Church is a Victorian Grade II* Listed Building in the village of Bemerton just to the west of Salisbury. Many of the original fixtures and fittings are still in place and also worthy of note are the capitals on the columns, each of which is very finely carved to individually unique designs. The church also features a rather lovely lych gate which serves as the village war memorial. The church is currently the focus of a community driven plan to convert it into a community centre whilst retaining space for worship. 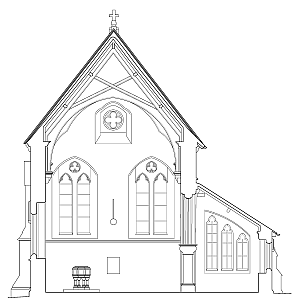 Wessex Archaeology were commissioned by Bemerton Community and Paul Stevens Architecture (the project architects) to undertake a metric survey of the church to assist with planning and designing the new community space and also to provide a record of the structure as it stands. We used terrestrial Laser Scanning to record the interior and exterior of the church as well as the interior of the tower and the lych gate. From this laser scan point cloud, we then created a set of orthographic images, images which look like photographs but are also scaled and contain no perspective distortion, making them suitable for measuring from. A set of traditional internal section drawings were also created through the church, capturing the long and short internal elevations. A number of animations of the data were also prepared for use by the community when talking about the proposals; these were also shown at the Remembrance Day commemorations, the lych gate being the village war memorial.